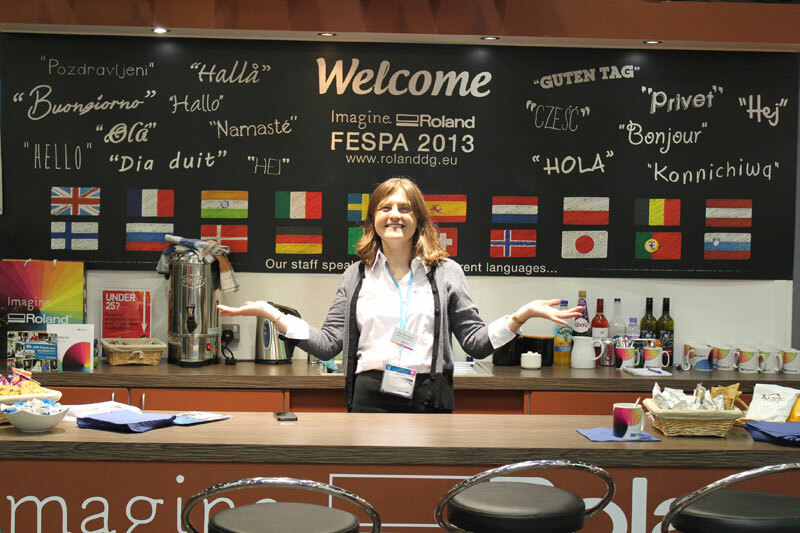 FESPA events are always busy and bustling affairs and FESPA 2013 was no exception. 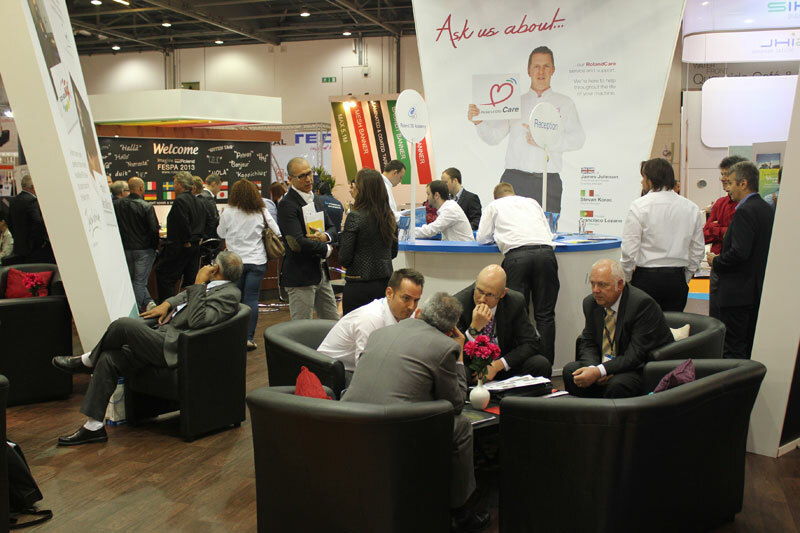 Billed in advance as the ‘best FESPA’ ever’, the show attracted the most globally diverse audience to date. In fact, almost two-thirds of the visitors travelled from outside the UK, with the largest groups being drawn from Germany, Benelux, France, Italy and Spain, as well as Scandinavia. And, once inside ExCel, visitors certainly found plenty to do and see, with over 600 stands, plus a whole host of ancillary features to choose from – in fact, their biggest problem was probably finding enough time to fit everything in – a dilemma with which I heartily empathise! So what were the highlights? 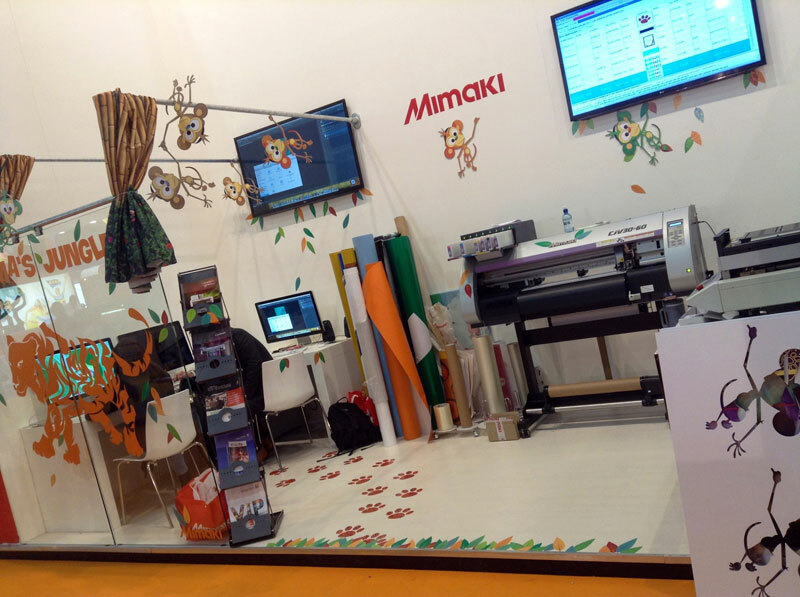 Well, as you can imagine, most of the major printer manufacturers used FESPA to unveil their latest offerings, with Mimaki showing a veritable plethora of machines, of all types and sizes. 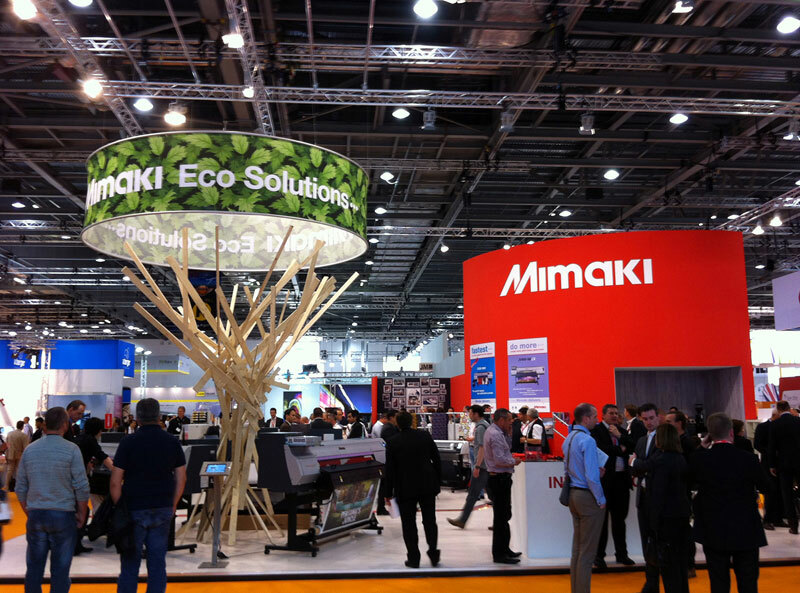 In addition the highly visible Mimaki stand offered a novel feature in the form of the aquarium, a glass fronted section that was home to three design students for the duration of the show. 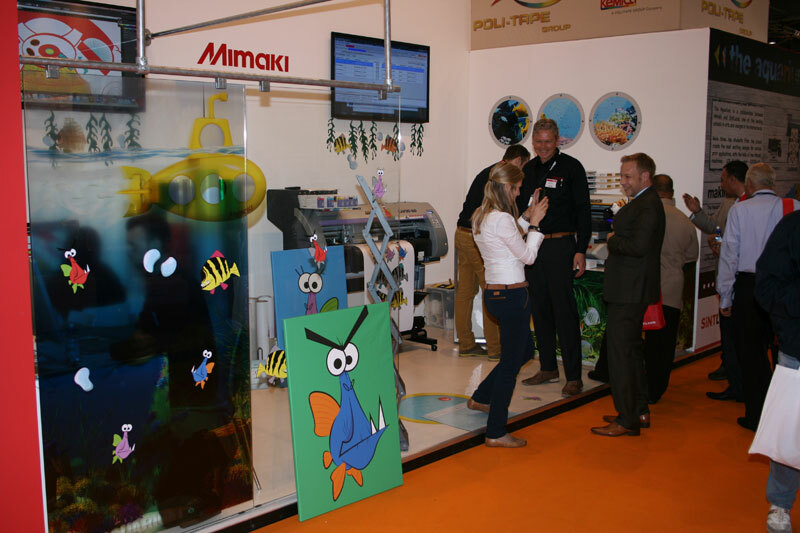 Using a CJV30-60 and a UJF-3042FX, they transformed their part of the stand every day, producing an eye-catching series of themed graphics that ranged from a 70’s living room, to a jungle habitat ideal for Mimaki’s adopted tiger Pertama and, of course, an aquarium! The exhibition also presented Mimaki with the opportunity to show its JV400SUV printer, the prototype of which was first introduced at FESPA Digital in Barcelona last year. Now available commercially, it combines the flexibility of solvent with the durability of Mimaki’s UV-cured inks to deliver very high quality output with vibrant colours and excellent outdoor durability. 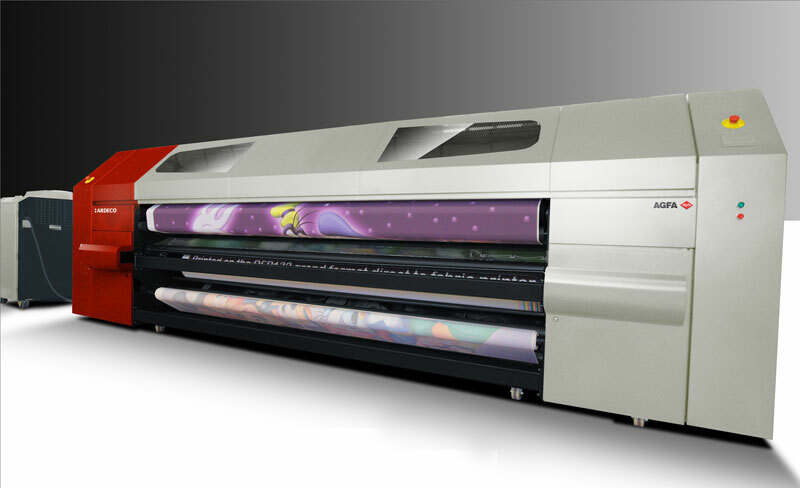 Also popular with visitors was the recently launched JFX500-2131 grand format UV flatbed printer with multiple ink options. On the very busy Roland DG stand the new additions to the SOLJET PRO4 series and the XF-640 printer and XR-640 printer/cutter, all attracted a lot of attention. Printing at speeds of up to 102m²/hr and designed for use with both outdoor and indoor applications, the XF-640, which is the ideal production tool for the full gamut of signs and graphics, features new, advanced print control technology that incorporates the printheads in a staggered design for maximum productivity. It is compatible with Roland’s newest eco-solvent inks, ECO-SOL MAX2, for an expanded colour gamut, fast drying times and a dual mirrored CMYK ink configuration for consistent colour imaging. Another stand attraction was the impressive selection of customer stories from Roland users around the world, while Roland’s resident caricaturist was kept busy throughout the show, drawing customers, dealers and partners while they enjoyed some of Roland’s famed hospitality at the on-stand Café. According to EFI, it completed record number of equipment sales deals during the show, with purchasers selecting EFI VUTEk and EFI Wide Format printers driven by EFI Fiery digital front-end systems. 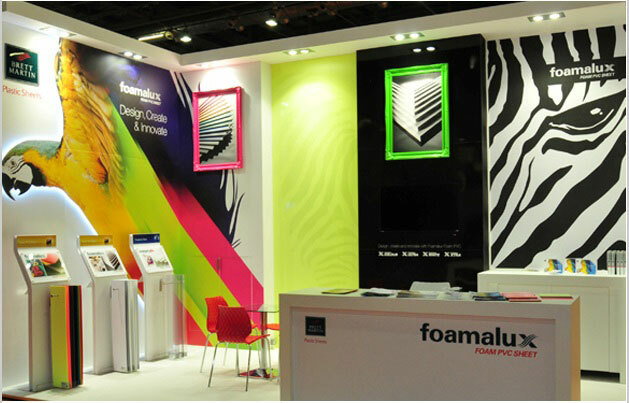 This year’s FESPA was also one of the EFI’s best yet in terms of software sales, with several companies also purchasing new MIS and ERP systems, and one visitor, Fengate-based Total Displays, purchasing a VUTEk QS3 Pro UV printer through EFI distributor CMYUK on the first day and then returning the following day to buy EFI Pace MIS software! 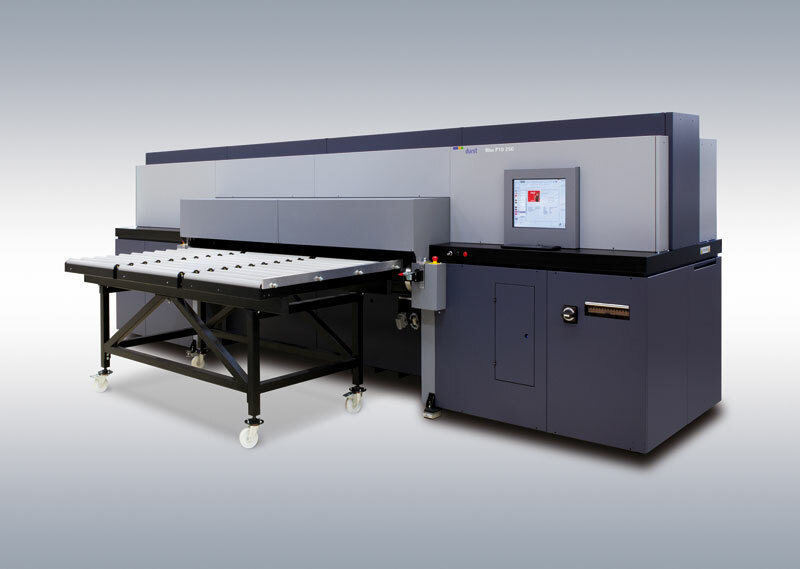 In order to satisfy the growing demand for direct printed textile output, Agfa Graphics introduced Ardeco, a new wide-format printer that combines sublimation capabilities with a textile transport system, which also comes in a choice of printhead configurations and features an inline cold- knife cutting system. It is designed for the volume production of all soft signage output, including backlit displays, flags and general displays printed onto polyester based fabrics up to a maximum print width of 3.2m, using high quality disperse inks. Further, a built in calendaring capability means there is no need for any additional fixation or finishing option. 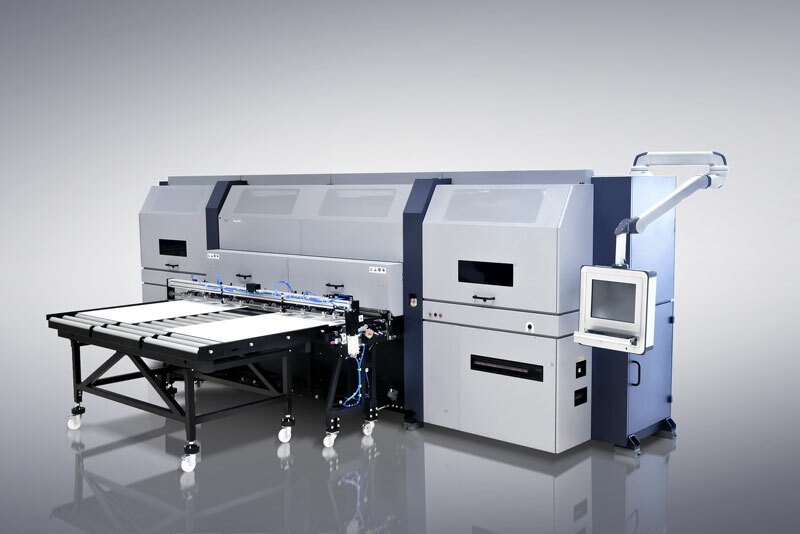 Also making their show debuts were the Jeti TitanX industrial flatbed and the Anapurna M2500, a 2.5m wide printer designed to handle both rigid and roll-fed media, which is ideal for users who need the flexibility of being able to work with standard rigid 2.4 x 1.2m boards across the full width of the bed, coupled with the ability to switch to flexible media up to 2.5m wide when required. Rho 1012 with a very small drop size of only 12 picolitres, which provides the highest resolution printing, whilst maintaining a productivity of up to 490 m² per hour at 1000 DPI. Another highlight was the super-wide Rho 500R Series roll-to-roll printers that offer a high level of media flexibility and print 3 x 1.6 m rolls together. Since Durst is one of the many companies looking towards new markets, it also used FESPA to debut the latest addition to its range of Rhotex textile printers. 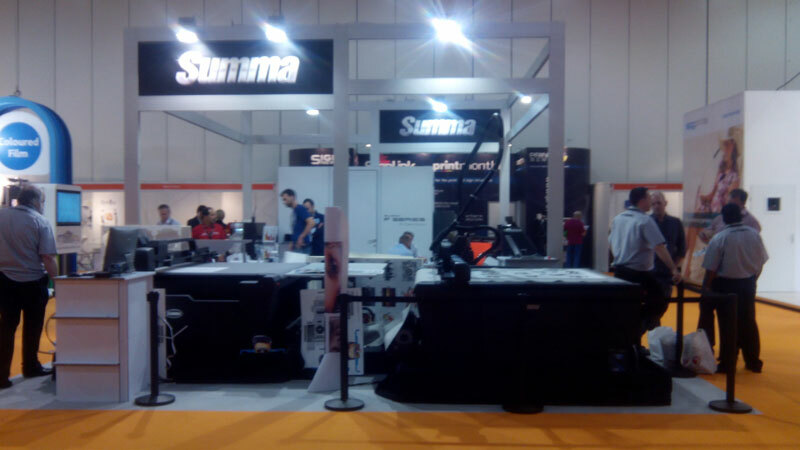 On the Summa stand, the dedicated Summa team showed numerous applications and various kinds of materials being cut with the multiple quick-change cutting tools on its flatbed F1612 machine, whilst also showing off its latest Pneumatic Oscillating Tool (POT), which is powered by compressed air and cuts material up 25mm thick. 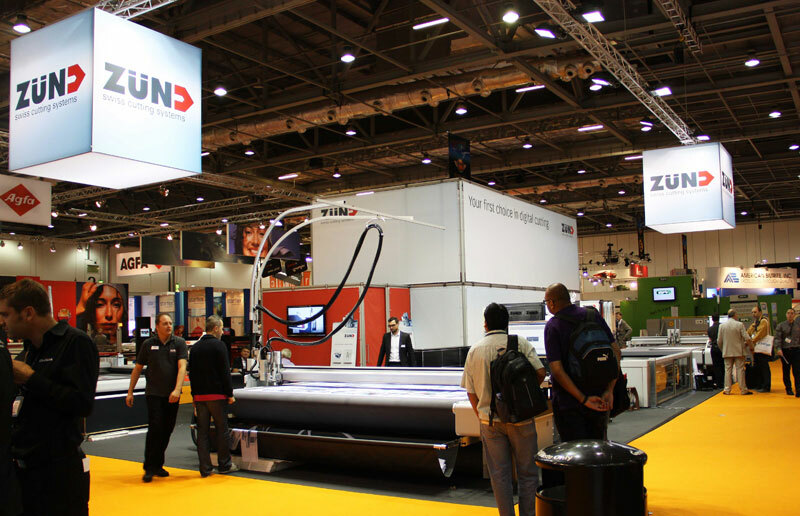 Zünd took the opportunity to present visitors with the latest highlights in its product line, including the ZCC 2.0, the newest version of the Zünd Cut Center software, which produces cutter-ready files from all widely used RIPS and nesting programs. Another stand highlight was the tandem vacuum system that permits efficient material loading/unloading without interrupting the cutting process. 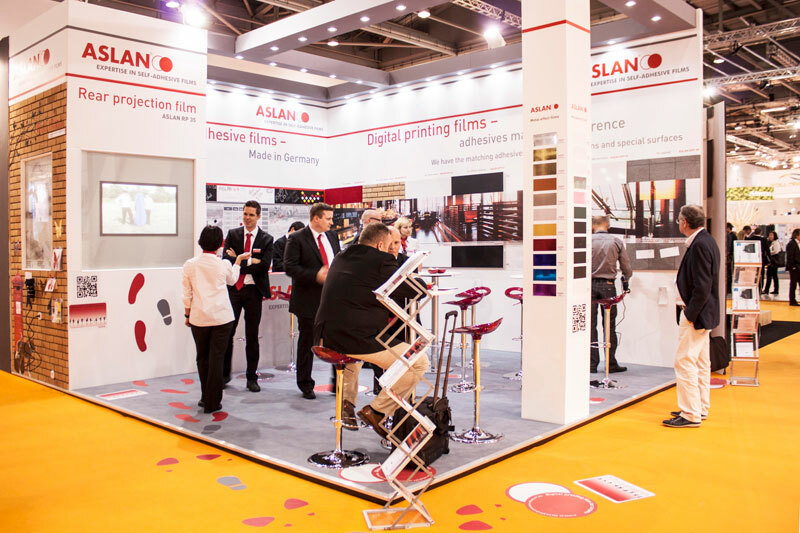 Aslan offered visitors the novel opportunity to apply colour film to the rough outdoor-type walls it had thoughtfully provided on its stand, while also introducing an extraordinary film for use as shoe sole decoration, as well as an eco friendly material for use as coffin designs! Nothing if not innovative! Brett Martin used the event to launch four new colours – Neon Pink, Neon Green, Raspberry and Black Sparkle – to its ever-popular Foamalux Colours range, as well as a new PETg transparent sheet Marpet-g.
At the same time, Hexis invited visitors to preview the latest additions to its Cast High Performance series, including the new multi-layered HX30000 cast vinyls with surface effect finishes, such as carbon, alligator, leather and matt, super matt and glitter colours. In addition, Hexis also kindly supplied Mimaki with a wide range of digital printing media for use within its Aquarium feature. 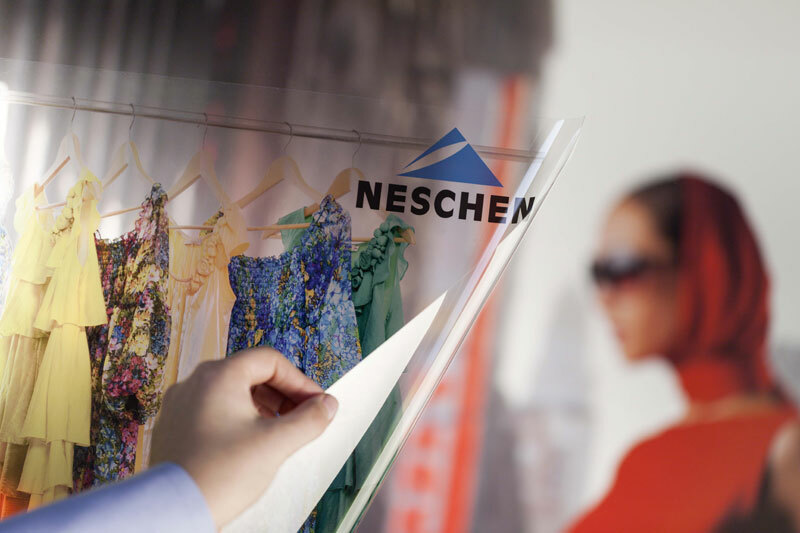 One of the highlights of the Neschen stand was the company’s new Solvoprint Window-Grip Ultra Clear, a polyester film that is designed for application to glass and other flat smooth surfaces. 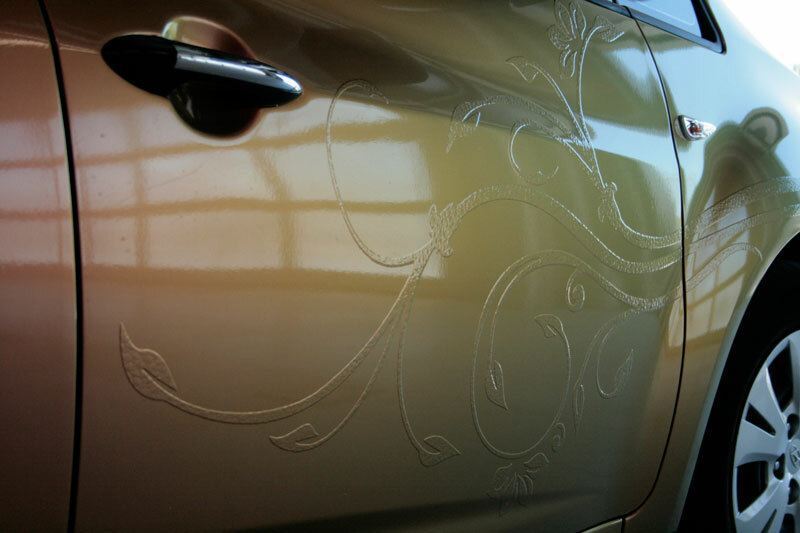 It can be used in conjunction with most commonly used ink technologies and for a wide range of applications. Spandex introduced a new initiative in the shape of ‘Digital on Demand’ which is designed to help customers to purchase exactly what they need to complete specific jobs and to use the company’s next day delivery service to minimise their material stockholding. General Manager Leon Watson commented: “In 1983, Spandex was the first business to sell coloured self-adhesive vinyl by the running metre, something we still do today and 20 years on, we are continuing to innovate, by introducing digital materials by the metre too.” Leon also revealed that the company had found at least 140 new customers at the show. 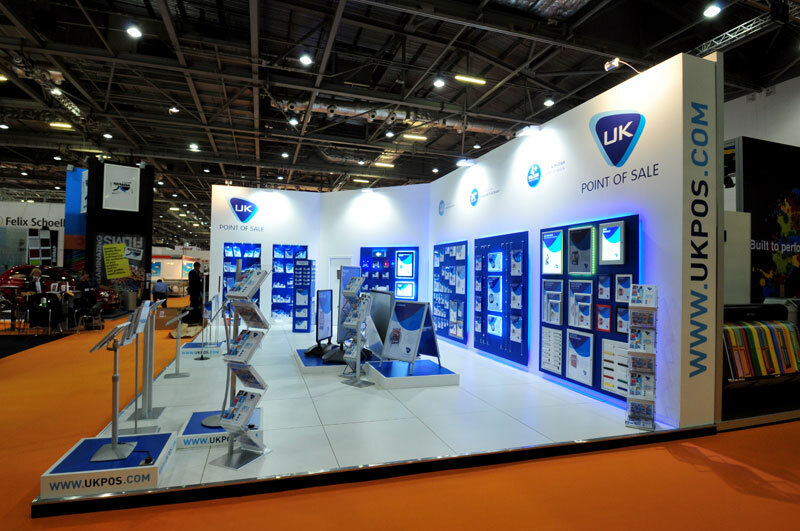 Elsewhere, UK Point of Sale launched a number of new products, including recent additions to its LED range, such as its series of new LED wallmount panel supports. Available anodised with white LED or in chrome with blue LED, the product is 30mm in diameter and offers a 20mm projection, making it perfect for presenting print in a clean and stylish way. Furthermore the product is now also available in red, blue, gold, black and chrome options in both 12mm diameter with 20mm projection and 20mm diameter with 25mm projection.